Wilmington, DE - The Kansas City Royals have announced the 2018 Players and Pitchers of the Year for their minor league affiliates and named infielder D.J. 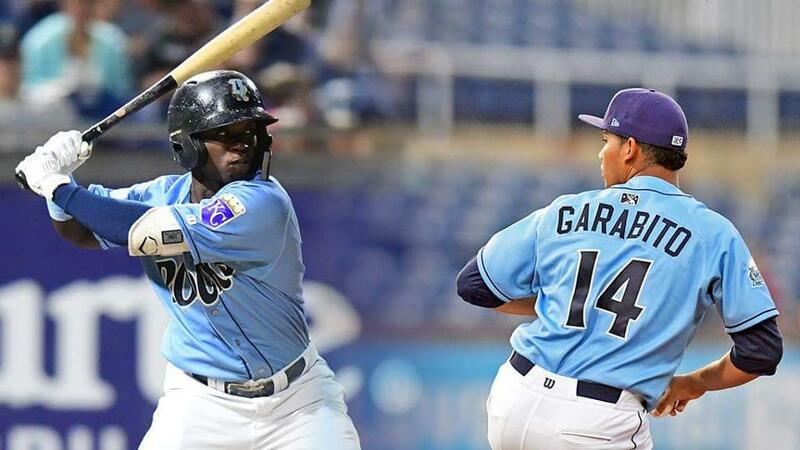 Burt as the Player of the Year for Wilmington while right-handed pitcher Gerson Garabito earned the honors as Pitcher of the Year for the Blue Rocks. It marks the second time Burt has been named Player of the Year by Kansas City (2016 with Low-A Lexington) while the first time Garabito has earned the award. Burt turned in a bounce-back season in 2018 after hitting .227 with 29 RBI with a .347 on-base percentage in 103 games a season ago with the Blue Crew. Throughout the 2018 season, Burt was a catalyst at the top of the order in the Blue Rocks lineup and also provided versatility defensively. Burt played multiple positions on the field including second base, shortstop, third base and left field. The 22-year-old from Fuquay-Varina, North Carolina was named a Mid-Season Carolina League All-Star after he hit .290 with six doubles, three triples, 19 RBI, 18 stolen bases and had a .385 on-base percentage. He also was the first Blue Rock since 2014 to be named a Post-Season All-Star and hit .274 with eight doubles, four triples and three home runs to go along with 30 RBI, 14 stolen bases and posted a .353 on-base percentage. Overall, the fourth round pick in 2014 by Kansas City hit .280 with 14 doubles, seven triples, three home runs and drove in 46 runs in 111 games. Burt was ranked amongst the league leaders in multiple offensive categories and paced the Carolina League in stolen bases (32), ranked fifth in on-base percentage (.367) and tied for eighth in the circuit in batting average (.280). He also led the Blue Rocks in triples (7), on-base percentage, tied for second on the team in hits (115), second in walks (59) and runs scored (72). Burt also was recognized by the Royals back in 2016 for his strong season in Low-A Lexington when he was tabbed the Legends' Player of the Year after hitting .257 with 25 extra-base hits, drove in a career-high 59 runs and stolre 43 bases. Garabito earned the ERA title in the Carolina League after posting a 3.16 ERA over 26 starts in his first season at the Advanced-A level. The right-hander became the first Blue Rock to lead the league in earned run average since 2014 when Glenn Sparkman led the circuit with a 1.56 ERA. Garabito also became the fifth Blue Rocks' pitcher to finish in the top-five in ERA in the Carolina League in the last five years. Signed by the Royals out of the Dominican Republic in 2012, the 23-year-old posted an 8-6 record to go along with his league-leading ERA. In 142.1 innings of work, he allowed just 50 earned runs during that span and held opponents to a .226 batting average against. He put together 13 quality starts and had a strong second half of the season. After going 2-5 with a 4.30 ERA through his first 13 starts at the Advanced-A level, Garabito went an impressive 6-1 with a 2.15 ERA in the same amount of outings in the second half of the campaign. Along with leading the league in ERA, Garabito also finished in the top-five in the CL in multiple categories including being tied for first in starts (26), second in batting average against (.226), third in innings pitched (142.1) and fifth in strikeouts (116). Garabito also paced all Royals' farmhands in ERA while finishing third in strikeouts. Season seats for the 2019 season will be available on October 18, while mini plans go on sale November 1 and groups packages are purchasable starting November 8.